The veteran UK glam-rockers commemorate their appearance on the 2007 Projekt Revolution package tour with this unsatisfying grab bag EP. Extended Play '07 was meant as a low-priced, US-only calling card to all the young Americans who were introduced to Placebo via the Projekt Revolution Tour. The tour found the veteran UK glam-power-pop trio supporting the likes of Linkin Park and My Chemical Romance. The Brian Molko-led Placebo have much more substance to them than those acts, and the experience must have been a bit humiliating. Then again, you gotta do what you gotta do to for exposure these days. This EP takes a single apiece from each of the band's five studio albums, and tacks on a trio of live tracks. In this context, everything comes off worse for wear. Breakthrough hit "Nancy Boy" is DIY fun, but just doesn't jive with the polished, rhythmic sheen of "Every You Every Me", "Taste in Men", and the like. While Placebo is a strong live act, that's not translated well in the selections here. "Pure Morning" remains clever as ever, but live it's exposed as a one-chord, one-trick idea. No wonder the band doesn't play it much. Taking on Kate Bush's "Running Up That Hill" is evidence of Placebo's good taste; but the original was all atmosphere, and without it, their live version descends into embarrassing melodrama. 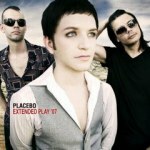 Placebo are an exceptional band, but Extended Play '07 is, in language Molko might use, a toss-off. Neophytes would do much better to pick up Once More With Feeling -- The Singles 1996-2004.